I'd been threatening to buy a new computer for some time before my hand was forced. I had to buy a new computer after a disastrous basement flood destroyed my old PC. I settled on the Dell Dimension 8300 and built a pretty nice custom configuration. I also discovered that the CD audio cables were not provided, but that was the only major annoyance. Although an "N" version without any Windows operating system preloaded at all was supposed to exist, I could not find any way to order it. 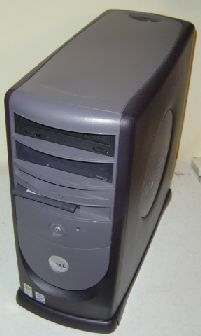 At the time I purchased this machine, I had no desire at all to run Windows XP. I replaced it with Windows 2000 Professional. This page is now some ten odd years old. I still own this Dimension 8300, though it has long since been demoted from daily use. Although Intel's Pentium 4 processor wasn't the powerhouse it was hyped up to be, this machine never performed as well as it should have. It would frequently become so I/O bound that I'd give up and shut it off. I still wonder if the motherboard might not have some kind of a defect. To confirm my suspicions, I later bought a secondhand Dimension 8300 and found that beat the pants off the original (despite running a slower CPU at first). So, I suppose that something about this example really is slightly broken. Over time, the Viewsonic monitor stopped working correctly due to bad capacitors, the USB hard drive's enclosure failed, both hard drives were replaced with larger models (500 and 750 GB), the OS was moved to Windows XP, the stock nVidia GeForce graphics card failed due to bad capacitors and this machine has been gradually demoted from my "daily use" computer in favor of an early 2009 era nVidia GeForce 9400GM based Macbook portable computer. Dell's cheapie 17" CRT still works perfectly to this day, though I'm not using it with this computer. Dell replaced the Zip drive several times under warranty before I gave up and removed it. I also upgraded the RAM to 3GB, though at some point it was moved back down to 2GB. These days I have tried to excise printers from as much of my computing life as is possible. You can see pictures here of the machine as I was setting it up. Copyright 2004 by William R. Walsh. Originally created September 10th, 2004 at 11:22 PM.